Graham Cracker Toffee Bark is an easy toffee recipe that can be made so many ways! This Christmas crack recipe is loved by all and can be made several different ways! About 10 years ago I made Christmas Crack for the first time. It was this peanut butter toffee bark and I instantly fell in LOVE. 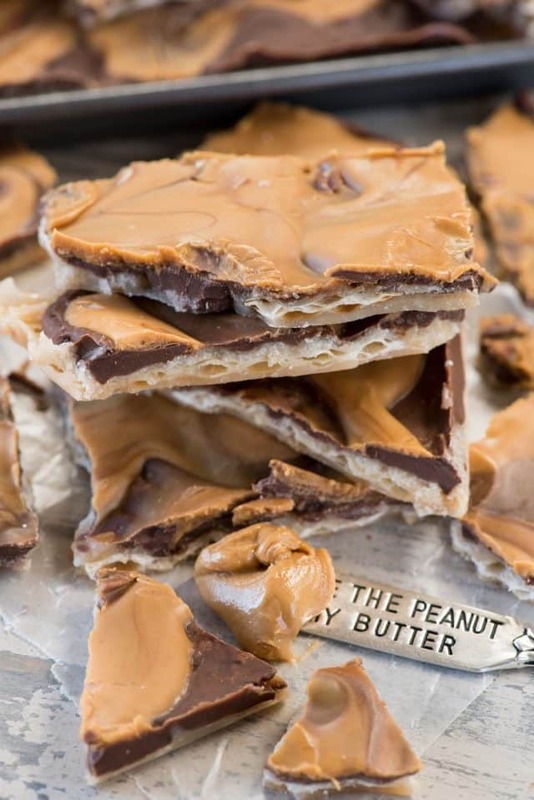 A layer of toffee over crackers with chocolate and peanut butter? If that’s not right I don’t want to know what is! Since then, I’ve made so much toffee bark. I make it every single year, and every time I do it different. 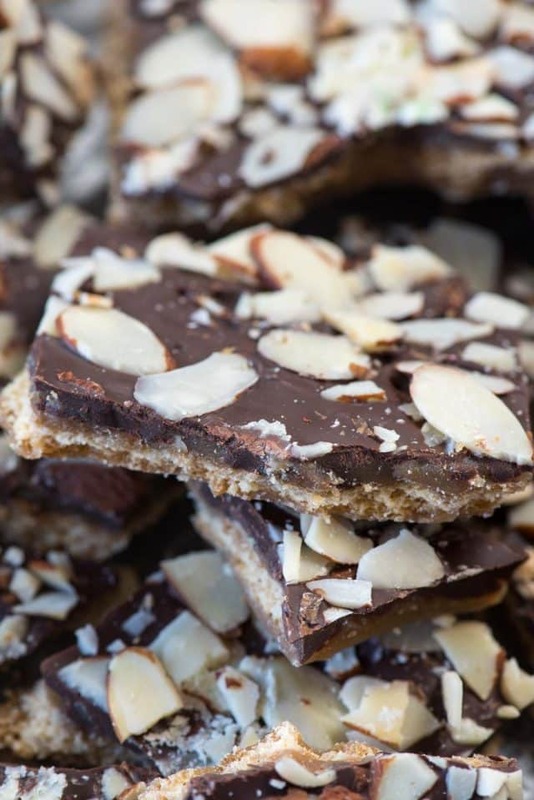 The original toffee bark uses matzo crackers, but I’ve made it with saltines, ritz crackers, and even chocolate chip cookies in my first cookbook! My absolute favorite though? Graham cracker toffee bark. Instead of crackers, you use graham crackers as the base; it’s FANTASTIC. 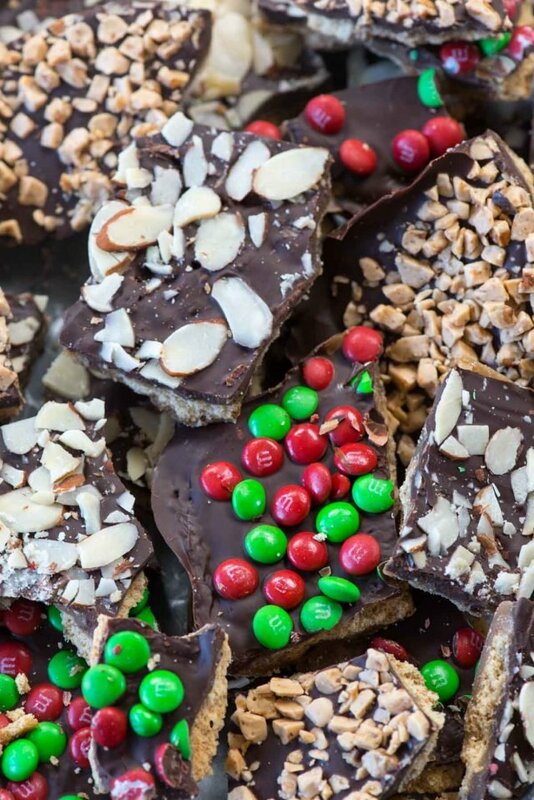 It’s our favorite go-to toffee bark recipe every holiday. I make batches and batches of it because toffee is Mel’s favorite and he absolutely LOVES graham crackers! The best part about this Christmas Crack recipe is that it can be made in so many ways with so many different toppings. I’m showing you three ideas today, but really the possibilities are endless. How do you make toffee bark? You just need a few simple ingredients and, yes, you need a candy thermometer for best success. Toppings, like M&Ms or toffee or nuts, or even peanut butter. If you’re making this toffee for Christmas, you can add Christmas candy to to the top. I sprinkled some of this bark with red and green mini M&Ms for fun, but you can use any kind of candy you like. What temperature should toffee bark be cooked to? You for sure should use a candy thermometer when making any sort of toffee. You can get a simple candy thermometer on amazon. You want to cook the butter and sugar mixture to 255°F for this recipe. Once it reaches that stage, you pour it over the crackers in the pan and then bake it to set. If you’re using chocolate chips, it’s easy to melt the chocolate: simply sprinkle them over the cooked toffee bark and then bake again for 2 minutes. The chocolate chips will melt (but keep their shape) and allow you to spread them into a layer all over the toffee. Then you add your toppings – like toffee bits or sliced almonds or other nuts! 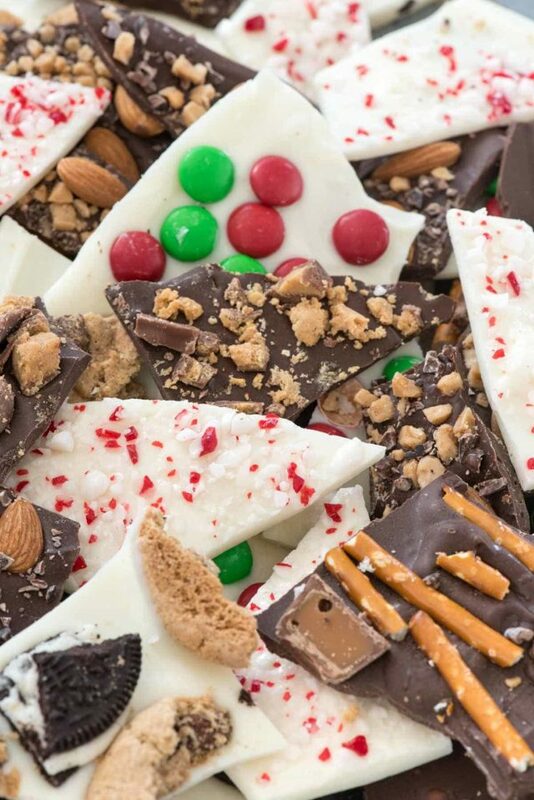 Christmas crack with graham crackers is such a great toffee bark recipe! Everyone will love this on your holiday platters. This recipe is also great for mailing; I often make large batches and then package it in baggies and mail to friends and family. Sugar Cookie Dough Bark is full of cookie dough! Oreo Peppermint Bark – ups the ante on a classic recipe. Peanut Butter Chocolate Toffee Bark uses chocolate graham crackers! Pie Crust Bark uses pie crust as a crunchy base for candy. Graham Cracker Toffee Bark is an easy Christmas Crack recipe made with graham crackers and any sort of topping you want! Preheat oven to 350°F. Line a rimmed baking sheet (approximately 11x16 or something similar) with foil and spray with nonstick cooking spray. Place graham crackers in a single layer on the cookie sheet, breaking as needed for them to fit. Set aside. Place butter in a medium saucepan and place over medium-low heat. Melt, then add the sugar and water. Stir to combine. Place a candy thermometer in the mixture and bring to a boil. Cook over medium-low heat until the mixture reaches 255°F. Do not stir. The mixture will turn golden brown. Once it reaches 255°F, remove from the heat and stir in the vanilla. Pour over the crackers in prepared pan and spread to coat evenly. Bake for 5 minutes. After 5 minutes, sprinkle the chocolate chips evenly over the hot pan. Place back in the oven for 2 minutes, or until the chocolate chips are melted (but they’ll still be holding their shape). You can use any toppings you like for this bark. 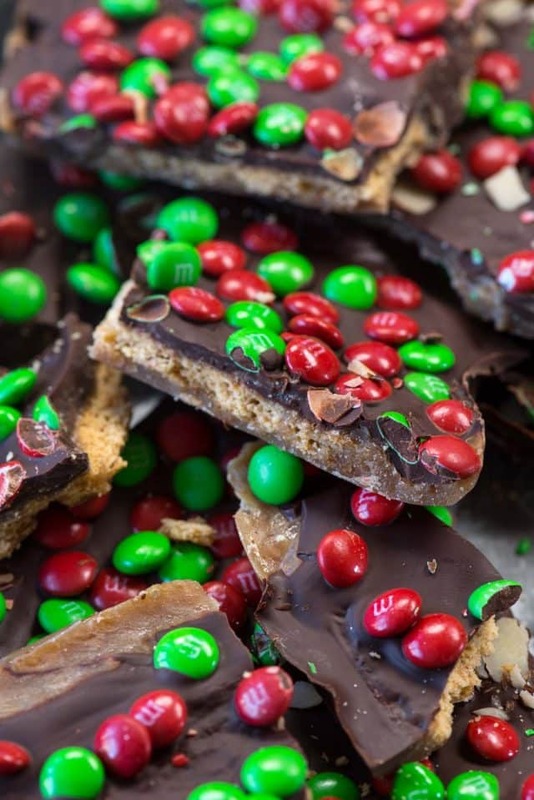 In the photos, I used toffee bits, sliced almonds, and mini holiday M&Ms. You can also use chopped peanut butter cups, chopped pecans or nuts of any kind, candy cane pieces, chopped cookies/Oreos, or anything you like. To use peanut butter, melt 1/4 cup peanut butter in the microwave (heat about 20 seconds). Pour it over the chocolate once you've spread it and then swirl. Get a candy thermometer here. White chocolate chips will NOT work with this method. To top with white chocolate, melt it separately in the microwave and spread it over the top of the cooked toffee. 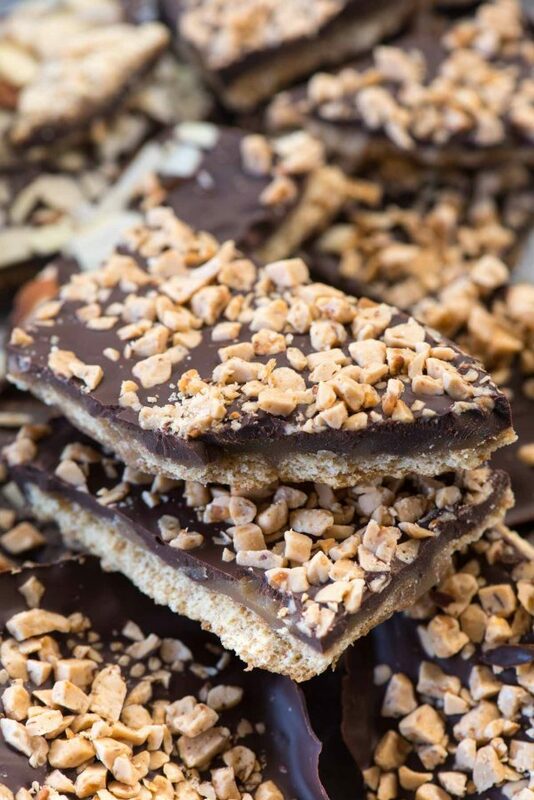 Peanut Butter Toffee Bark uses Matzo Crackers! 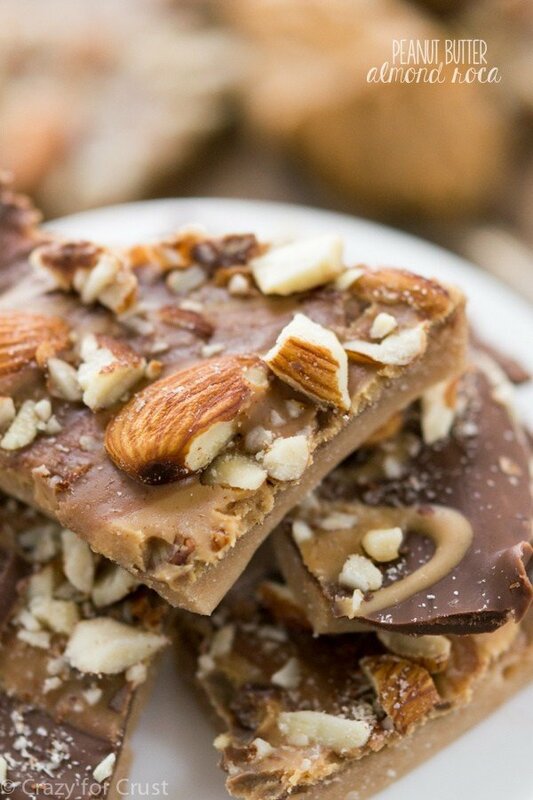 Peanut Butter Almond Roca – toffee with peanut butter! This recipe was originally published in 2011. Photos and recipe updated 2018. Looks like a great recipe. I just wish we didn’t use the term “crack” so lightly. The damage done to so many from the real crack just causes this term to grate. Wish I had some now. I lovelovelove graham cracker toffee bark!! These variations are great!